Pub Style Burgers - (20) 8 oz. Looking for that perfect PUB Style Burger. Look no more. These burgers are certified Antibiotic Free. A softer pack makes for a tender, juicy and tasty eating experience. No growth hormones, no steroids, no antibiotics - ever! Buffalo Burgers - (20) 5 oz. 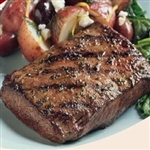 Incredibly tender skirt steaks dry rubbed in a Ontario seasoning and cracked pepper blend. Prized for their flavor this is the steak of choice for making fajitas. Try using in your favorite beef recipes, it will add a new flavor and dimension to your dish! So versatile, yet so easy. Our Pepper Medley Steaks are sure to bring out the Chef in you.